PHOTOS 15: SIGN, SIGN, EVERYWHERE A SIGN, PART 1: AM I COMING OR GOING?? 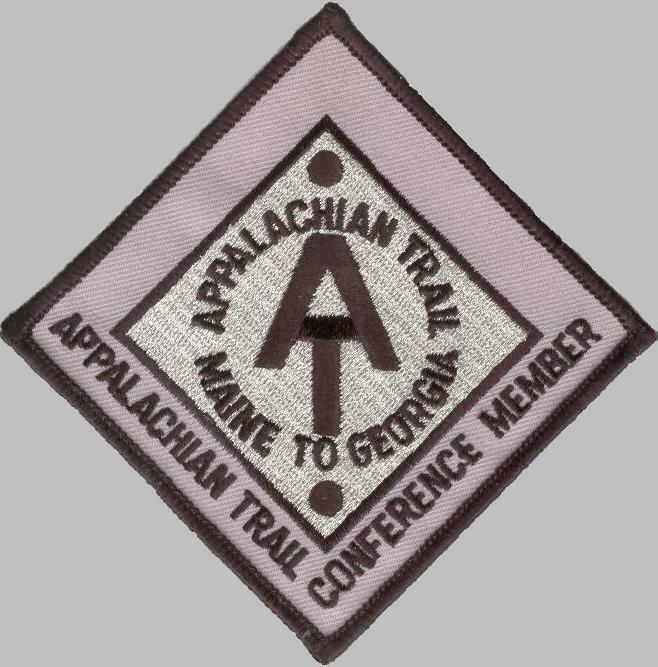 You know, there were some days on the Appalachian Trail when I wasn't so sure whether I was coming or going, especially by the time I got to Maine and was asked the vague question above at a road crossing. I don't think the inquisitor appreciated my evasive response, but what can you expect from a tired runner/hiker after four months of following little white blazes all day long?? Some mornings it was all Jim and I could do to make sure I was heading in the right direction on the Trail! 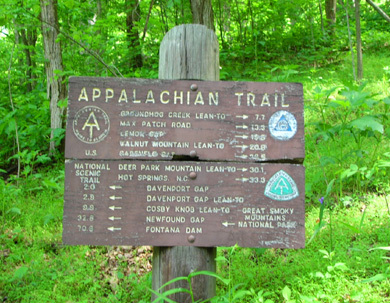 The Appalachian Trail Conservancy helps hikers find their way on the AT by providing not only millions of white blazes (and a few painted arrows) but also thousands of signs, plaques, posts, and devices like the survey marker above in Virginia. For simplicity, I'll refer to the whole category as "signs." 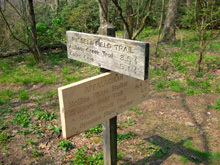 The majority of the Trail signs tell hikers how far it is to the next landmark(s) - a road, shelter, summit, etc. I call those "directional" signs. 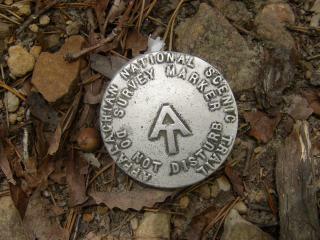 They are the most prevalent type of sign on the Trail and are usually pretty accurate. I'll highlight directional signs in this essay. 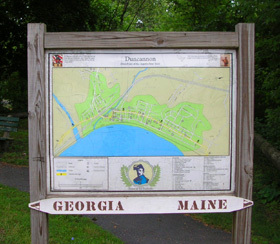 The next largest category of signs identify landmarks, such as shelters, gaps, summits, elevations, rivers, swamps, towns, parks, road crossings, state lines, historical sites, and side trails with other destinations. I'll show you some of these in Photos 16 and 17. 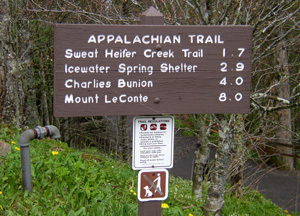 Other signs give warnings about trail hazards and alternate bad-weather routes. 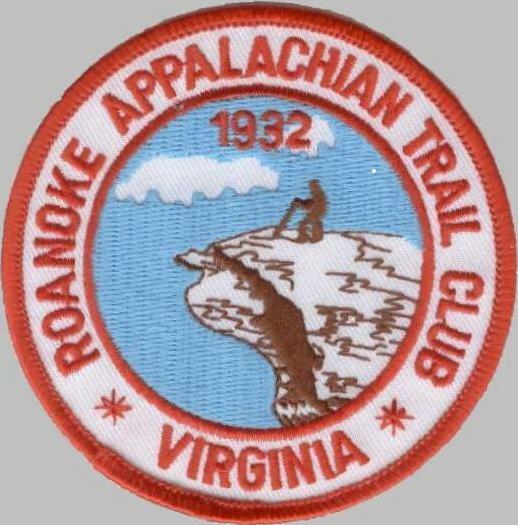 They advise hikers of dangerous exposed rocks and ridges, detours, private property and other boundaries, bears, Lyme disease, bridges that are out, flooding on trail, fragile alpine zones, and endangered species of plants and animals. All of these should be heeded, but some are actually humorous, as you'll see in Photos 18. AT signs come in all shapes, colors, sizes, and degrees of complexity. They are made from a variety of materials, including bare and treated wood, painted wood (from subtle sage green in Connecticut to can't-miss blaze orange in New Hampshire), plastic, metal, stone, concrete, and even paper! Despite a few complaints about lack of clear signage, I think most of the signs along the AT are well-placed and very helpful. I appreciate all the hard work that goes into producing, placing, and maintaining them, especially the ones in very inaccessible places - someone has to carry them in and put them in place. Thank you! I took a lot of photos of signs to help me identify photos of scenery later, so I have a good variety of signs to give you a feel for what you might see along or near the Trail (we found some great ones in towns, too). I hope some of them make you smile or bring back pleasant Trail memories of our own. 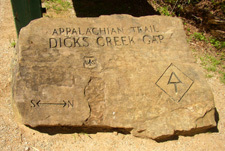 The most basic directional signs along the AT are simple wooden ones that are similar to the one above, with only two or three destinations and mileages. 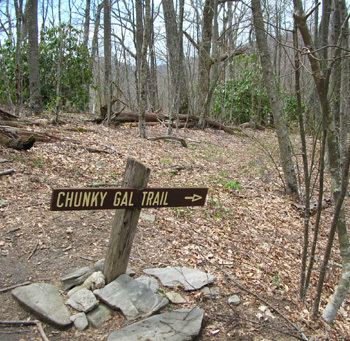 The signs above are interesting in that the top one (the Russell Field side trail to Cades Cove) is weathered and worn, and the AT sign below is almost new. 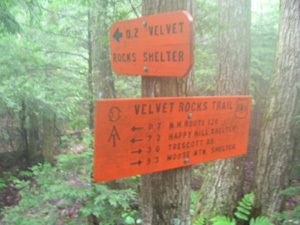 As wet as it gets in the Smokies, let's hope the new sign is made from treated wood. Simple wooden signs can possibly withstand the elements better and are more distinctive if they are painted. Connecticut has some sophisticated soft green signs, while New Hampshire specializes in blaze-orange ones that stand out boldly in the rain and snow. You can't miss this sign even on a foggy day like Day 113! Then there are the fancier directional signs. The fairly new wooden structure below, near Standing Indian Campground in North Carolina (Day 8), provides hikers with a lot of information and serves almost as a bulletin board. The sign below as you enter Duncannon, PA (Day 69) from the south is helpful because it indicates north (Maine) and south (Georgia) and shows the route through town. As many hikers have noted in their journals, the hardest places to follow the AT blazes are through towns. New Hampshire is also the state most badly in need of some cans of white paint. 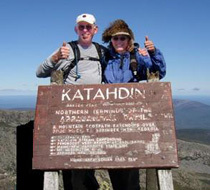 They have far fewer blazes per mile than any other state on the Trail. Fortunately, I never got lost there. If you're hiking in the Whites/Presies, just be sure to consult your map frequently or write down the names of all the trails you'll be on. AM I GOING THE RIGHT DIRECTION?? Many times last summer I wished more signs clearly indicated "north" and "south" on them. Two places where this really mattered to me: at trail heads and shelters. 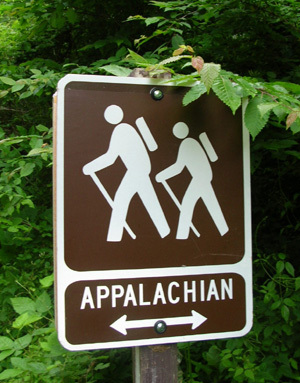 This problem affects backpackers as well as hikers and runners who are crewed. The AT crosses numerous dirt and paved roads, some with AT parking, many without. When Jim dropped me off at those trail heads I had to make sure I was going the right direction. One problem was unmarked trail heads - no sign at all to indicate this was the AT. We'd have to look hard for a blaze either direction, sometimes several yards into the woods. Unfortunately, there aren't mileage/destination signs at every trail head. So if you don't know for sure which way is up (er, north), you might discover you've gone the wrong direction and get some bonus miles. 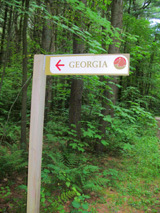 Even this simple little sign by a road in Massachusetts (Day 102) lets you know if you're going north or south! 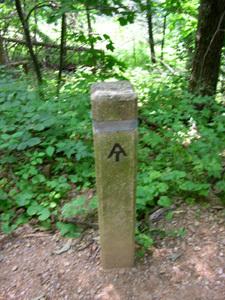 Pennsylvania also had some trail head signs marked with north and south arrows. They were harder to read from a vehicle (dark brown painted wood with not much contrast in the lettering), but hikers could see them up close just fine. Sometimes I'd get turned around when I went to shelters to sign the registers. It didn't matter whether the shelters were right next to the Trail or on side trails. I quickly learned I had to remember which way I turned in to a shelter so I'd continue in the correct direction when I returned to the AT. It seems like that would be even harder for backpackers who sleep overnight in the shelters. (I heard their stories of accidental back-tracking.) Sometimes there are no signs at the shelters, or signs don't indicate north and south. Gotta stay alert on the Trail for all kinds of things! That one is nice because it identifies the gap AND has "north" and "south" on it. That's a lot fancier than the "signs" on some other rocks I saw, but even painted arrows are effective on mountain summits. 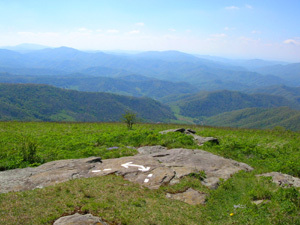 Although it was sunny on this North Carolina bald - one of the Hump Mountains, I believe - on Day 27, the arrow might make route-finding easier on a foggy day. I think the main purpose of this arrow is to emphasize a scenic view, however! 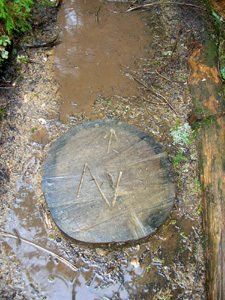 At trail intersections, there would be destinations on all four sides. While these "signs" will last about forever, they are hard to read with Granny eyes because the embossed words are so little and the same color as the metal band. I saw a few concrete/aggregate posts like this in several other states, too. Next up: Are we there yet?? 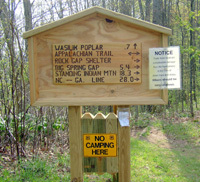 (signs along the AT that identify various landmarks). I hope they bring back good memories for readers who have been there - and pique the interest of ones who haven't!